Hospital from J.H.B. Latrobe’s Picture of Baltimore (1832). Johns Hopkins University Sheridan Libraries, F 189.B1 P53 1842 QUARTO. On March 21, 1814, Dr. James Smyth and Dr. Colin Mackenzie, managers of the Maryland Hospital, received an 25 year extension on their lease from the City of Baltimore. The extension included new conditions that required the institution to construct a new four-story brick building with two three-story wings funded by loans from the state and a new lottery. The history of public hospitals in Baltimore began in 1794 when local residents established a “temporary retreat for the Strangers and Sea-faring people.” The Baltimore Committee of Health acquired the property during the yellow fever epidemic of 1798 (an outbreak that killed over 5,000 people from Baltimore to Boston) and maintained the hospital with public funds until 1808 when the institution was first leased to Smythe and Mackenzie. Under its new private management, Baltimore covered the costs for public patients at a fixed rate and controlled the management of the hospital through an appointed board of five visitors. 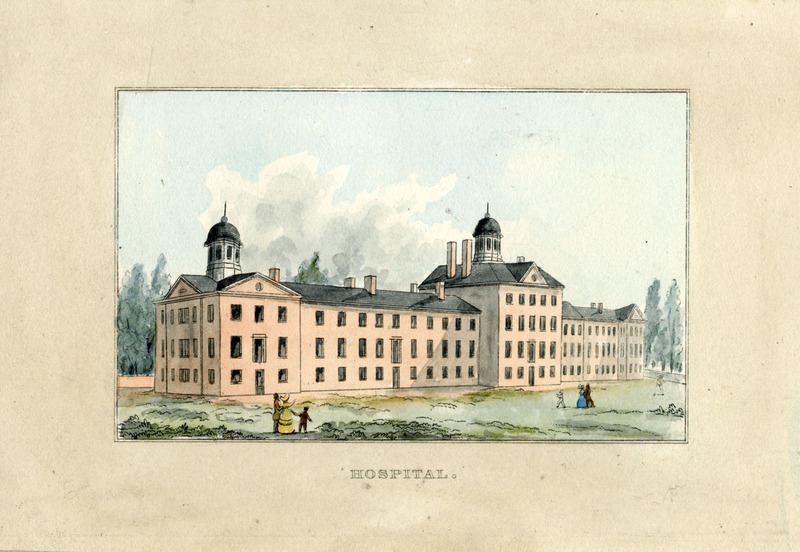 Known variously as the Public Hospital, the City Hospital and the Maryland Hospital for the Insane, this institution moved in 1852 to Catonsville where it survives as the Spring Grove Hospital Center. Learn more about the history of Spring Grove in this detailed history of the institution.